Seattle bartender Andrew Friedman found inspiration for this delicious coffee cocktail from Stumptown Coffee’s espresso blend. “Their Hairbender espresso is so expressive that I thought it deserved to be in a cocktail,” says Friedman. 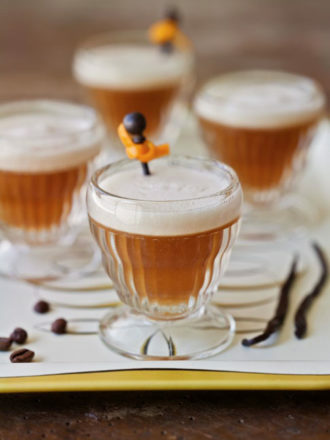 Taking a cue from the trademark froth of a classic flip cocktail, this velvety concoction, which is featured in Imbibe‘s book, The American Cocktail, harmonizes the chocolaty notes of the espresso with the vanilla-flecked Navan liqueur. In a mixing glass and tin, add the spring from a Hawthorn strainer and the egg whites, and shake until a light meringue forms; set this aside. In another mixing glass, add the other ingredients with ice and shake. Add this mix to the egg whites, quickly shake, pour into a glass and garnish.